You are going to find today’s guest, Marva Dasef, to be a prolific and original story teller. I suspect that her home in the Pacific Northwest had a lot to do with her choice of subject matter for her supernatural/historical fiction novel, Bad Spelling. The book is to be released on October 14th, but the trailer is already out. It’s beautifully done and I will try to give you the link. If it doesn’t work from this blog, you can always paste it into your browser. And I highly recommend that you do. This blog post relates information about the Shamans of Northern Siberia, the setting of the story. Leave a comment for Marva to be entered into her drawing. Marva Dasef is a writer living in the Pacific Northwest with her husband and a fat white cat. Retired from thirty-five years in the software industry, she has now turned her energies to writing fiction and finds it a much more satisfying occupation. Marva has published more than forty stories in a number of on-line and print magazines, with several included in Best of anthologies. She has several already published books of fantasy, science fiction, and mystery. A few more are scheduled for 2011 and 2012 from her super duper publisher, MuseItUp. I asked Marva if she has any hobbies. Here is her answer: No hobbies. I never comprehended the concept since I quit collecting horse pictures, statues, etc. when I was around 11. I like to watch old TV on Netflix. I went through all the Doctor Who episodes available, and I’m now working my way through Young Indiana Jones. I wish I could hook Netflix to my TV, but our TV is too old to do that. Maybe someday. A klutzy witch, a shaman’s curse, a quest to save her family. Can Kat find her magic in time? Andy is a troll…sort of. Stolen at birth by the Trolless Gorm to replace one of her newborn triplets, Andy is through and through troll. He loves his brothers Endy and Indy, respects the troll King Ole, and is overall pretty happy being a troll. However, when Gorm is near death, she tells Andy that he’s bortbyting, a changeling. His real family is the Sami tribe of Siberia. Well, we already know that Kat’s father is a Sami from Siberia. Hmm. Coincidence? I think not. Let’s talk about the Siberian side of the family. The Samis (also spelled Sámi or Saami) are a widespread extended clan of people closely related to the North American Eskimos and Aleutes. You’ve heard of Samoyed dogs, the breed of sled dog bred by these northernmost indigenous people. The Lapps are the same people just a little further west. There is lots of interesting information on the Sami people out on the internet. I discovered them by trundling around the web looking for an indigenous people living in Siberia. I wanted Kat’s father to be completely different from the Euro-Nordic witches of Galdorheim. I hit the motherload with the Samis. These are the perfect folks to be the middle link between witches and trolls. The Free Encyclopedia is a treasure trove of information. I spent a lot of time following links and reading. These are people not widely known by the “civilized” world. The Samis of Siberia are primarily hunter/gatherers with fishing being a major food source. You can imagine that near the Arctic Circle, farming is not possible. Russia pulled the same dirty trick on the Samis as the US pulled on the indigenous tribes of North America: relocation. They moved them all next door to the Barents Sea, which, naturally, is not a desirable piece of real estate. I know we could all go on and on about the injustices of the world, but that’s not what I’m doing here. I encourage you to follow the links from the Free Encyclopedia. It’s an addictive trail of fascinating information. But the central idea in the Witches of Galdorheim books is the existence of this type of people exactly where they are in Siberia. Worked out great for my story. In “Bad Spelling,” Kat has to deal with a shaman of the Sami people. First she has to find him, and that’s a pretty long journey in itself. Along the way, she meets Andy and they travel to the Siberian north to find him. The Samis practice shamanism with various shamans handling different parts of life. The Tadebya advises on the right time to go fishing or move the village (the Samis are nomadic). He handles the practical day-to-day needs of the people. The Vidutana deals with the heavens so is the go-to guy if you’re in need of heavenly guidance. The Sambana is more like the crazy monk living in a cave somewhere. Everybody around knows he’s got some kind of power, but he’s also dangerous. He can cast evil spells, deals with black magic, and is an all-around unsavory character. This is very simplistic, and you won’t have to try very hard to find differences in my interpretations of shamanistic matters with real-world examples. But, hey, I’m writing a fantasy here and am allowed to mess with all things magical to my heart’s content. Ivansi rocked from one foot to the other and then rubbed his right mukluk against his left calf. He had much to do before leaving, and he wanted to get on with it. He’d never say it to anybody, but he didn’t think his grandfather was that good a shaman. Even so, it wasn’t his place to question shamans of the tribe. For now, all he wanted to know was whether or not his hunt would succeed, but his grandfather never hurried things along. None of the shamans ever did. The hunt he proposed was dangerous; that he knew all too well, since his own son, Borisi, disappeared many turns of the sun before. His chances of success were good, for he was a seasoned hunter, and would not be going alone. But even a large kayak could easily disappear into the fierce Barents Sea, never to be seen again. Ivansi’s mind wandered to Borisi. A few months after his son disappeared, Ivansi had steeled his nerves and gone to seek the assistance of the Sambana, the village shaman who could contact the dead. Unlike the Tadebya, who sought the guidance of the gods in everyday matters, or the Vidutana, who could provide information on the heavens, the Sambana lived alone and away from the tribe. The very nature of the Sambana’s talent made him a fearful presence, so the tribe avoided contact with the old man unless absolutely necessary, which seemed to suit the ancient shaman just fine. The people were convinced the Sambana had gone crazy years before. The rumor was the Sambana’s wife had run away with a witch man. Some said the Sambana had lived for more than a thousand years, but nobody could prove it one way or the other. Ivansi had feared his son was dead but wanted to know for sure. 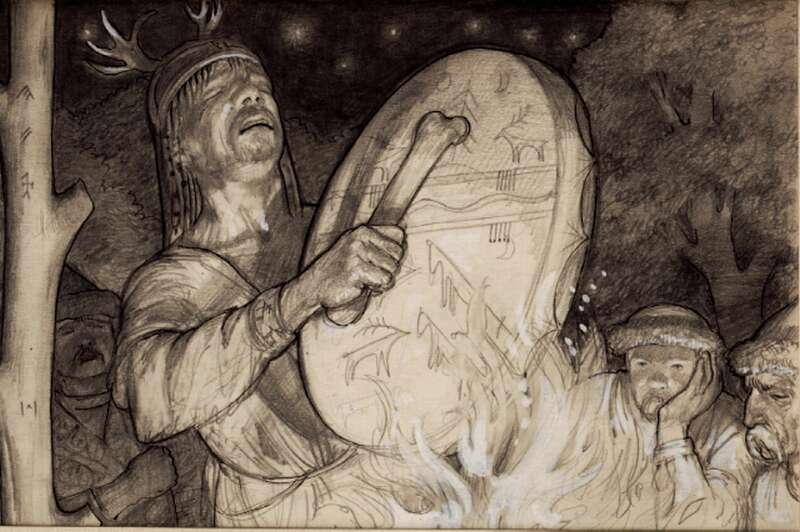 The Sambana sought Borisi’s spirit in his seeing flame but could not contact him. Usually, the purpose of contact with the dead was to aid the soul into the afterlife. Since he could not speak to Borisi, the Sambana decided the young man must still live. He was lost, obviously, but not dead. The Sambana told Ivansi not to worry; he would protect his son against evil. The Sambana sent a magic shield to seek Borisi wherever he was and surround him. Ivansi’s attention returned to the present when the Tadebya snuffed out the flame and looked up at him. “Yes, Tadebya, I will.” Ivansi exited the shaman’s tent and went to tell the rest of his hunting party they could leave right away. The five other hunters had prepared the two kayaks and loaded the gear needed for the week-long trip. With twenty hours of dark each day, it made no difference whether they began the hunt during the day or at night, although they preferred to travel during the dark times and hunt in the twilight hours. Marva, this is very interesting reading. It’s clever the way you have interwoven the two different cultures by placing Kat in the middle. I’m looking forward to reading the whole story. And congratulations, also, to Kaytalin Platt for the beautiful book cover. It’s been a pleasure having you on my blog today, Marva. Thank you.